Property Location Located in Bangkok (Don Muang), Sleep Box by Miracle is close to IT Square and Lumpinee Boxing Stadium. 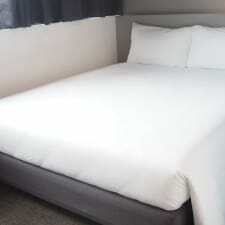 This hotel is within the vicinity of IMPACT Arena and SCG Stadium. Rooms Make yourself at home in one of the 25 air-conditioned rooms featuring flat-screen televisions. Complimentary wireless Internet access is available to keep you connected. Bathrooms have showers and complimentary toiletries. Conveniences include complimentary bottled water, and housekeeping is provided daily. Dining Satisfy your appetite at a coffee shop/café serving guests of Sleep Box by Miracle.Make yourself at home in one of the 25 air-conditioned rooms featuring flat-screen televisions. Complimentary wireless Internet access is available to keep you connected. Bathrooms have showers and complimentary toiletries. Conveniences include complimentary bottled water, and housekeeping is provided daily.Located in Bangkok (Don Muang), Sleep Box by Miracle is close to IT Square and Lumpinee Boxing Stadium.